We circle with the Seasons. 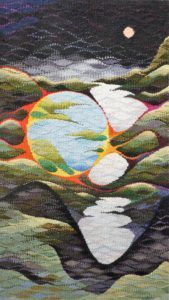 Read More About "We Circle The Seasons"
It was in December 1992 that I displayed an exhibition of my tapestries, paintings and writings entitled “We Circle with the Seasons”. The themes and concepts which fascinated and entranced me then have continued to this day. I have refined, developed and cultivated specific aspects. Distilling the vast array of the visual natural primary experiences of nature and the passing of time, filtering the prose and poetry of writers and thinkers, has enhanced how I view other artists work and has resulted in this renewed and fresh exploration. The cycles of the seasons and the ever changing transitions from the cold winter into a warming spring and through the latent heat of summer to glorious colours of autumn are enduring. These continuing changes occur over an extended period, small differences on a day to day basis gradually effect the totality of the season. When do we know that a “season” has arrived? For the world in which we live is constantly effecting a process of change. The artist, noticing the change of hue and tint, of light and shade and also the alluring aromas of the seasons and the sounds of nature becomes attuned to the yearly cycles. We all observe and thrill at the returning migrant birds and enjoy hearing the call of the first Cuckoo and the Curlew, the flight of the wild geese and their honking calls in the first light of a frosty bright autumn morning. Whether we live in the country or the town these transitions are noted with the daily change from dark to light, night to day; from cold to warmer weather and with the growth bursting forth from the sleeping earth. It is a passing of time, – a passage through time, – a passing through. Artists, musicians, writers and thinkers, naturalists and observers have over the centuries used these themes as a source of inspiration. Being both an artist and tapestry weaver I too have become embroiled by their cyclical recurring events. “Days begin and end in the dead of night. They are not shaped long, in the manner of things which leads to ends – arrow, road, man’s life on earth. Civilisation tries to persuade us that we are moving continually towards a distant goal. Have we forgotten that our only goal is to live and to live each and every day? Then our true goal is achieved. All civilised people see the day beginning at dawn or a little after or a long time after or whatever time their work begins. This they lengthen according to their tasks, during what they call “all day long”: and end it when they close their eyes. As well as using art, literature and music as reference materials or starting points for my ideas, concepts and thoughts it is the direct experience which I value highly. In my mind it stands alone for further consideration, thought and which ultimately may contribute to my visual work. For I want to take in the whole experience, to interpret, to reject and to select, to identify and to abstract. Other creative people efforts, whether the written word, a painted or constructed picture, a musical composition includes only that which was chosen, it is a selected part. Having identified a theme or concept I proceed to assembling a range of elements and ideas, sketches and writings which may or may not be incorporated. Visual language requires the identification of the vocabulary and the structure of the grammar, the syntax or the methods of construction of these first ideas. Returning to the initial point of inspiration is the awareness and experiencing of the changing seasons I am all too aware of the role played by the Sun and Moon respectively. The feminine Moon is symbolic, it is universally understood to represent the rhythms of time, past time, present time and future time as it embraces the cycle. Moon phases symbolise immortality and eternity, enlightenment and even the darker side of nature. The middle ground between light and dark, day and night often represents the realm between conscious and the unconscious. The phases of the Moon offer an analogy for the stages of development of human life. For the new Moon is the start of growth, of infancy; while the crescent Moon is representative of youth and of adolescence. It is the full Moon which shows maturity while finally the waning Moon represents the decline of life towards sleep and death. Having seen recently the arrival of the “harvest” or “red moon” and the impact of the “super moon” their movement amid ever changing orbits has occupied my thinking. The sight of the Moon alone, seemingly stationary in the dark night sky reminded me of the poetry of P. B. Shelley and especially his poem “To the Moon”. “Art thou pale for weariness? To watch the sunrise rise during the winter and to follow its passage across the horizon during the subsequent months reinforces this cyclical constant. This daily cycle, of day and night, light and dark, has played out over the millennia since the dawn of time and impacted on the human condition. It has effected all human emotions, has bombarded the senses and puzzled and questioned philosophies, provided inspiration for the creative mind as well as giving a routine for life. Whilst this routine is constant it is not necessarily static or similar, for with the oscillating apogee and perigee of the bodies within our solar system gradual changes occur. The elliptical nature of the orbit, the curving movement and the content symbols of the Sun, Moon and our Earth is apparent in all my paintings and tapestries. The straight line has never interested me for it lacks movement, is too restrained and formal. A line is drawn, that’s it, a line going nowhere and coming from nowhere. Too defined for my thinking for I look to a fluidity and constant motion. This is reinforced as I seek to always develop my thinking and my textiles, whether by concepts or by technique. I do not wish to stand still and repeat or duplicate instead seeking to solve new problems and continually advancing. For the weaver a curved line is alien to the vertical – horizontal fundamentals and can present major problems with difficulties in tension control. However for the artist the curved line introduces vitality and energy through the continuing changes of direction and space. Philip Rawson in his book “Drawing” concisely describes this important phenomenon. “The curved stroke, the variety of which is immense, is based upon the concept of change: for a curve is drawn by an instrument that is constantly changing its direction across the ground. The qualities of curves, and their content of experience of change, are one of the most important sources of artistic vitality, for they extend the meaning of the drawn forms via the suggestion of change in the dimension of time. Thus the parallels between the curving line and the orbits of both the Moon and our Earth are abundantly clear. We are all affected by the solstices and cycles and the transitions they embody. Walking along pathways through trees perhaps by a river or by the sea new vistas reveal themselves at every turn. The path we take is synonymous with the path or river of life, the turn, the bend up ahead offers an unknown. The changes are continuous for the passage through time never halts. Or over the dry stone wall, the hill or the horizon? or the darkness and the unknown spiritual world? I am fascinated by the boundaries, the edges and the margins, between night and day, between the seasons. Of the burst of spring vitality and energy with its resultant verdant growth through to the autumn decay and the icy bitter of winter we can only observe and celebrate. The half-light of dawn or dusk is a mystical time when the atmosphere changes as does the temperature, similarly the colours, the hues and tones of the landscape. I recall the past, the next, the time to come is to follow only I am in the present. Do we ever reach the next, the future, does it exist? With time passing seemingly ever quicker is the circle completed or are we consumed within a world that is for ever changing? As an observer, a witness to all this transformation I feel I must respond, to record in both word and line, and to analyse and synthesise ideas and concepts. Within our natural environment the four elements, air, fire, earth and water combine with enormous variety to display real energy, combine this with all our senses and the creative individual is totally and utterly consumed and inspired. This process has engaged me for many decades, my sketch books, writings, paintings and drawings have created a vocabulary which I use today and hopefully for tomorrow. My woven tapestries must be viewed not as an end product but as stepping stones. Experience and understanding, or questioning is taken forward in a sequential way to progress and to advance my thoughts. My recent thoughts have been associated with the relationship and juxtaposition between the Sun and the Moon. At this time of day, sunset, the Earth has absorbed the day time benefits of the warming sun and from our position it becomes lost beneath the skyline. A period of transition when the shadows become long and the colours take on a different hue, perhaps sounds are enhanced, muffled and the darkness develops. Familiar shapes and forms become blurred and un- recognisable. Are the demons of the night arising and beginning their wanderings across the countryside? What lies ahead within the oncoming darkness? As we look towards the last remnants of the daylight, that final line of light is often diffused into the clouds, their colours and hues change, becoming more intense as the light is lost. Our time is come, we can reflect on the day’s events, the numerous and various happenings, the endeavours and the accomplishments all of which now reside in the past. When the sky is coloured at these moments we are prompted to recall the folk lore saying, “red sky at night shepherds delight”. It is almost impossible to observe the setting sun and not dream for every sunset brings the prospect of a new dawn, a renewal, a fresh start. With the sun below the horizon and sky now a void, darkened and unoccupied the pale Moon makes her entrance. Her nightly wanderings to begin. She is wild and free in her wildness and knows nothing of borders, customs or rules and cares for nothing. She is alone, companionless endlessly traversing and orbiting our earth. Her cyclical passage across time and space is observed, her shape does not change. Even when it looks as if her form or profile is changing, whether waxing or waning it never changes. The departed invisible sun has seen to that! The parameters of ideas and concepts have been established, the words recorded, poetry and prose rehearsed. Now I need to concentrate on the essential and necessary visualisation of form and shape and commit these through line, colour and texture and ultimately into a woven tapestry. My wanderings are just beginning, the journey although begun does not have a known destination. I must trust and depend on my processes of creativity, established over the past decades yet still being refined and developed. Let my challenge begin. Just as the Moon is wandering companionless and alone I am following a similar path for it is I alone who knows where I wish to travel. Autumn has given way to winter and the thoughts of a warming spring stir in my mind. Just as the Moon has continued on her perambulations and we on Earth have continued to circle the Sun I am aware of the evidence of the passing of time. The seasons have changed which is so noticeable in the colours and hues of our surroundings, daylight is increasing and the demons of the dark are subdued and now in early spring my thinking on this theme has progressed. Recent experiences of Scotland and my ongoing relationship with the poetry of G. M. Hopkins, especially of “Inversnaid”, which so eloquently excites, elates, and stimulates my thought processes has enabled me to take further exploratory steps forwards. The loneliness of the undulating rolling landscapes, the dramatic rugged skyline amid the close proximity of lochs and rivers has provided me with a back cloth. The apparent silent and stillness of the water’s surface, little movement – a little texture, restful and peaceful, it awaits disturbance. The contours and shapes of adjacent hills and moors extend, echo and evolve into the depths of a malignant Stygian blackness of the Loch. Multiple horizons deceive the eye, islands float yet are attached to the land mass. Above the eye line horizon, amid a cloudless night sky the Moon alone appears, with no companions, no friends or fellow travellers for company. She has the freedom to frolic, to wander and to follow her own curving pathway and to commune with the landscape below. We all seek enlightenment and understanding, we all view the world in individual and differing ways and we may never attain the nirvana of empathy and insight. I am reminded of the writings of Dogen Zenil, the Buddhist priest (1200 – 1253) and especially his thoughts on enlightenment. Following on I turned to the Zen Buddhist philosophy of Zen Haiku, which explores the human relationship with the natural world at specific times of the day. It searches within the human condition of the sensibilities of the love of nature and simplicity, reflecting on the spiritual moods linked to the time of day. Writings and poetry pass on these thoughts and the Hiaku poem, consisting of three lines and seventeen syllables, is used to illuminate and to pass on the philosophy. This severe restriction promotes conciseness, simplicity, intensity and a directness of expression. Focusing on mainly images from nature it is much more than a type of poem. It is a way of looking at the very nature of existence. From the silent stillness of the loch to the restless refreshing nature of the flowing river. The twisting, tumbling, meandering wanderings of the rivers flow describe vividly the passage of time. Overseen by the high places, resplendent lofty pinnacles of Lochnagar, its buttresses and jagged skyline profile overlook the whole as well as giving nurture to the river and by its gift of snow melt liquor. While beneath its dominant features lies the loch, both a repository and a reservoir, the waters rise and fall over the seasons yet give continuously to the descending river. While high above the arcing solitary Moon is travelling and musing, observing yet also influencing events below. Tidal movements and their changes ensures a continuum of relationships, subtle yet profound, of life giving and nurturing. The passing of eons, of millennia is demonstrated by the effects of erosion, of jagged rocks worn glass smooth, of rounded pebbles which mosaic the river beds. Thus my scene is set, the visible becoming tangible, but what of the Sun’s role in this theatre of thought. For hidden from view, sunk beneath the horizon its daytime effects are still apparent. The light it gives, so freely, focuses on its position by the reflections and shapes of the Moon. Her form evolves, through waxing and waning yet physically remains the same. How to incorporate the invisible within the two dimensional form of an image. The stable circular Sun must be present and play a part in the whole yet at the same time remain separate. It has a major role, to be influential and dominant yet also subservient within the production. The shapes of the natural landscape will offer a contrast to the circle, the content symbol that is the Sun. perspective and depth, contrasting and harmonious the colour scheme, shape and form are all required and must be combined. Many are the emotions expressed in this visual interpretation of this continuing and developing story. Locations must vary, from the mountains and lochs, down through the tumbling torrents of the river and on to the sea, where islands seem to float on in the stream. Each and every scene echoes the influences of both the wandering Moon and the daily cycle of the Earth’s journey around the Sun. Analysis, synthesis and selection has occurred, along with simplification and concentration of the starting aims and objectives and many exploratory drawings and watercolour paintings completed. 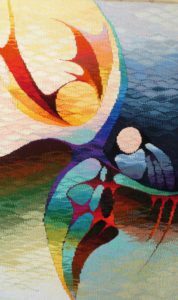 Careful reflection is required for the choice of the final design to be used as a stepping stone to the loom and ultimately a woven tapestry. I will not copy this design cartoon faithfully but extend my ideas and concepts further. Should I feel that I have said everything in these drawings and paintings I will go no further. But whatever happens my journey will not end here but even if and when a tapestry is being woven further thoughts will be born which may be the starting point for future adventures.